Several weeks ago, I did a post titled “Threads”, which dealt with the family linkages between Brig. Gen. Hugh Mercer, Revolutionary War hero, his grandson, Col. George S. Patton of the 22nd Virginia Infantry, who was mortally wounded during the Third Battle of Winchester on September 19, 1864, and Gen. George S. Patton, Jr., the great World War II hero, who was the grandson of the Civil War officer. In that post, I promised I would pull a few more threads regarding General Patton, who is one of my favorites. Adna Romanza Chaffee was born in Orwell, Ohio on April 14, 1842. In July 1861, Chaffee, only 19 years old, enlisted in the newly-formed 6th U. S. Cavalry as a private. In early 1862, he was promoted to sergeant, and to first sergeant in September 1862. 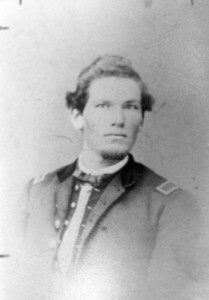 As a reward for his good service, Secretary of War Edwin M. Stanton arranged for him to be appointed second lieutenant in April 1863. Although only 21 years old, he was in command of a company of the 6th U. S. by the time of the Battle of Gettysburg that summer. 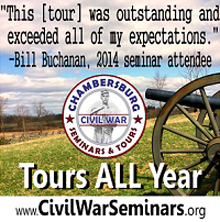 On July 3, 1863, the 6th U. S. Cavalry was sent on an expedition to Fairfield, Pennsylvania. 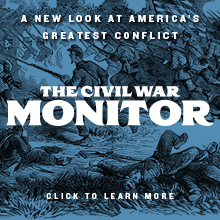 There, the 6th U. S. took an entire brigade of Confederate cavalry, and was thrashed. Chaffee was wounded and captured that afternoon. The Confederates tried to parole Chaffee, but he refused a parole in the field, obeying a recent War Department directive that the men of the 6th U. S. not give their paroles if captured. The frustrated Confederates, concerned that they could not manage their large haul of prisoners, simply left Chaffee behind with the other wounded. Chaffee was found laying on the ground in the orchard, being tended to by one of his men, a “neatly cut crimson edged hole in his blue pantaloons over the front part of his thigh. He was quite cheerful.” As a reward for his gallantry in the fighting and for his steadfast refusal to give his parole, Chaffee was brevetted to first lieutenant, effective July 3, 1863. He recovered from his wound and returned to duty with the 6th U. S. in early September 1863. He suffered a second combat wound, and was promoted to first lieutenant in February 1865. He remained in the Regular Army after the war, and was promoted to captain. He spent 30 years fighting Indians in the west and southwest. In July 1888, he was promoted to major and was transferred to the one of the so-called “Buffalo Soldier” units, the 9th U. S. Cavalry. In 1897, he was promoted to colonel and assumed command of the 3rd U. S. Cavalry. 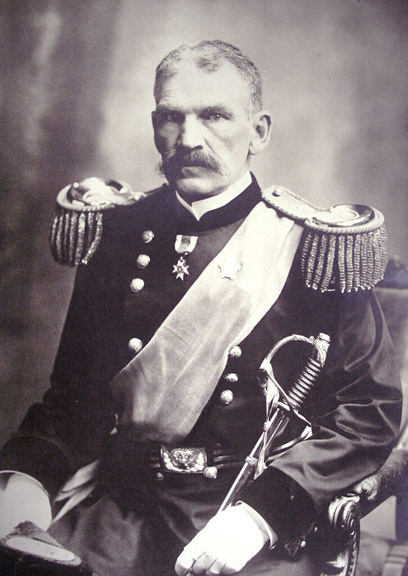 He was commissioned brigadier general of volunteers in the Spanish-American War, and then to major general of volunteers after the American victory at El Caney, Cuba, in July 1898. From 1898-1900, he served as chief of staff to the military governor of Cuba, Gen. Leonard Wood. When the Boxer Rebellion broke out in China in 1900, Chaffee was sent to Peking as commander of the U. S. Army’s China Relief Expedition. He played a major role in putting down the rebellion and then was promoted to major general in the Regular Army in 1901 in recognition of those accomplishments. He served as military governor of the Philippines for a few months, and then assumed command of the Department of the East, a position he held until 1903. In 1904, he was promoted to lieutenant general and became chief of staff of the United States Army, a position he held for a bit over two years. He was one of two old horse cavalrymen to rise from the rank of private to serve as chief of staff of the Army (a profile of the other officer to go from private of cavalry to chief of staff of the army can be found here). Chaffee retired in February 1906 and died on November 1, 1914. He was interred in Arlington National Cemetery. His son, Adna Romanza Chaffee, Jr., was born in Junction City, Kansas on September 23, 1884. He graduated from West Point in 1906, and was appointed a lieutenant of cavalry, following in his famous father’s footsteps. Chaffee soon became known as the best horseman in the army. In World War I, he was an infantry major, serving in the IV Corps during the St. Mihiel offensive and then as a colonel in the III Corps during the Meuse-Argonne Offensive. After the war ended, he reverted to his Regular Army rank of captain of cavalry and became an instructor at the General Staff School at Fort Leavenworth, Kansas. During the 1920’s, with the help of a young horse cavalryman who had commanded armor during World War I–Capt. 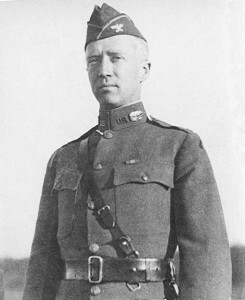 George S. Patton, Jr.–helped to develop tank doctrine and tactics. In 1927, he predicted that mechanized armies would dominate the next war and helped to develop the U. S. Army’s first true armored force. He was assigned to the 1st Cavalry Division in 1931, and continued to work on the development of the U. S. Army’s armored forces and capabilities. 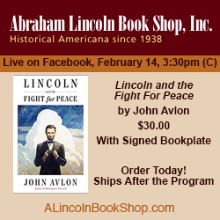 He soon became the leading advocate for American armored forces. In 1938, he assumed command of the 7th Cavalry Brigade (Mechanized), the U. S. Army’s only armored force. He worked tirelessly for the further development and advancement of armored forces, and his predictions proved true when France surrendered after the German blitzkrieg in 1940. After the collapse of France, Chaffee finally convinced Congress that the United States needed to develop an effective armored force very quickly. Congress authorized the creation of the 1st and 2nd Armored Divisions in 1940, and Chaffee was promoted to major general and was given command of this force. Unfortunately, Chaffee was quite ill. He died of cancer at the young age of 56 on August 22, 1941, just before the United States was forced to enter World War II, and is remembered as the father of the U. S. Army’s armored force. The M24 Chaffee light tank was named in his honor. In the 1920’s, George S. Patton, Jr., an old horse cavalryman who designed the U. S. Army’s last cavalry saber, also tirelessly worked to advance the cause of armor. He had successfully commander light tanks during World War I, and saw the potential of tanks as a decisive battlefield weapon. He unsuccessfully petitioned Congress to fund an armored force and wrote articles on tactics that were published in the Journal of the United States Cavalry Association, a professional journal for Regular Army cavalrymen. In July 1940, Patton–now a colonel–was given command of the 2nd Armored Brigade, 2nd Armored Division. He became assistant division commander the following October, and was promoted to brigadier general on October 2, 1940. He served as acting division command from November 1940 to April 1941, and was promoted to major general and given command of the 2nd Armored Division a few days later. Were Chaffee still alive in 1941, he undoubtedly would have been given command of the I Armored Corps when it was formed. However, his premature death opened that slot for George S. Patton, Jr. and he was promoted to major general and appointed to command the I Armored Corps. The rest, as they say, is history. Today, armor serves most of the traditional roles of horse cavalry: scouting, screening, and reconnaissance, and many armored units are actually designated as cavalry units. It has a great legacy for doing so, with direct links to some of the greatest horse cavalrymen of the post-Civil War era of the United States Army. As you will see from the image at the beginning of this paragraph, the traditional crossed sabers logo of the cavalry has been amended to reflect the direct link between horse cavalry and armored service in the modern army. If you pull the various threads, you find a direct connection between the Army of the Potomac’s Cavalry Corps and the legendary commander of the Third Army, George S. Patton, Jr. That direct connection flows through two great horse soldiers, Adna Romanza Chaffee and his son, Adna Romanza Chaffee, Jr.
Eric, this is fascinating! Thanks so much for sharing. This is my favorite part of studying history. Thank you for the detailed accounts here Eric. This is amazing work and a fascinating read. I want to made suggestions to correct your text if you don’t mind. First of all the Chaffee’s middle name – Romanza, Adna Romanza Chaffee (to proof it look at the Arlington cemetery website). Second – there’s no 1st Cavalry Division (Mechanized) in 1931. The first cavalry regiment that was mechanized was the 1st cavalry regiment which was stay in Marfa then and was brought to Fort Knox to participate in mechanization in early January 1933. The Gasoline brigade of 1928 and the Detachment for Mechanized Regiment which was constituted in 1930 was the ancestors of the mechanized cavalry regiment. And couple of words about Patton. He was left the Tank Corps after Eisenhower and transfer back to Cavalry. Although he was one of the early advocates of tank and mechanization he’s drift apart from the topic and to the 1930s was more and more sceptical about tanks and armored development. In 1938 he ended up with John Herr, the Chief of Cavalry, who openly oppose the mechanization of his branch. Under his direction Patton begin to think about ‘modernizing’ the M1913 saber to reintroduce it to Cavalry (although it was discontinued in 1934) and support his pro-horse rhetoric. When the things was at the edge and Chaffee Jr. openly confronted Herr and his agenda by introducing the cause to Chief of Staff Marshall Patton understand that cavalry day is over and in the 1940 request for transferring to 2d Armored division where he eventually became the Major General. 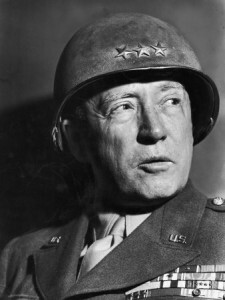 Herr proposed him a Division command in his branch but Patton wisely decided to leave his patron of last years. Anyway, thanks for posting the story! It sounds like you have been drinking deep from the well of Major General Isaac Davis White, who long ago argued that cavalry was a “concept” and it was not written in stone that cavalry mean troopers had to be mounted on horses. The “concept” being of course — the ability to quickly break through and envelope enemy positions and exploit (if not create) the ensuing chaos in enemy rear areas. From Dragoons to cavalry to armor to “mechanized infantry” to airmobile/air assault, the concept remains the same, just the technology changes. I shiver at what a George S. Patton might do today with a combined-arms force like the 1st Cavalry Division. The last “real” old horse cavalryman to be chief of staff was Creighton Abrams, who also had the unfortunate distinction of being the first COS to die in office. Being a West Point grad Abrams started as a lieutenant and not a private, but he did start out in the horse cavalry.